Underwater photography made easy: take your OM-D E-M5 Mark II down to depths of 45 meters with this PT-EP13 waterproof housing and capture the amazing scenes of marine life. 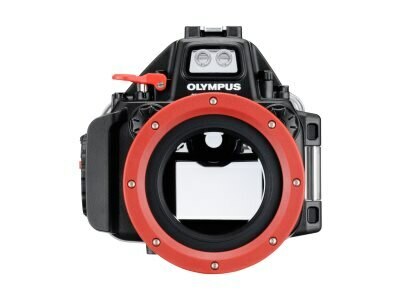 An ingenious system of high-pressure seals provides full protection against water while the pick-up viewfinder and two separately available fiber-optic cables enable underwater shots or movies taken with pristine image quality. Just like the camera it protects, this underwater housing and accessory system is also very compact and light-weight for easy handling. The PT-E13's premium polycarbonate body has not only been engineered to keep out all moisture but also protects the camera from knocks and bumps on land, too. The housing is compatible with a wide range of M.Zuiko digital Micro Four Thirds lenses and even some Four Thirds lenses when used with the dedicated adapters. A whole range of underwater accessories including high-performance electronic flash, brackets and zoom and focusing gear gives you full control of your aquatic photography and movie-making!